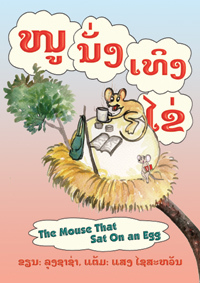 The Mouse that Sat on an Egg: and read to her child (Published in Laos). "Nuu-Nuu is my sister, and now I'm a proud uncle!" Following in the grand tradition of Horton, a small mouse named Nuu-Nuu agrees to substitute for a lazy bird that needs a break from egg-sitting. But lazy birds - well, they're not very responsible, and Nuu-Nuu sits for much longer than she had expected. She fills her days by reading, with time out to protect the egg from whatever threatens it. In the end, her efforts bring a welcome surprise. Her story is a fun celebration both reading, and of taking responsibility. 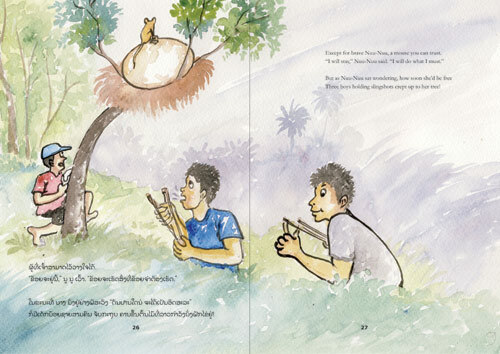 This book was made possible through the generosity of Lin Palmer of England. Thank you! Click on the cover or pages to see a larger image of them.